ADA Solutions — Computer Comforts, Inc.
All colleges must face the challenges of ADA compliance in their classrooms. When most of us think of wheelchair compliance issues, we only notice the obvious, such as wheelchair ramps, electronic doorways and modified drinking fountains. Unfortunately, being compliant is a little more complicated and sometimes mysterious because of the many interpretations of the guidelines. Computer Comforts believes that all students/faculty should have easy access to all necessary tools required in the learning environment. As a furniture manufacturer, our job is to make sure the student tables and lecterns improve the learning experience. When we can seamlessly blend our table solutions into a classroom, the phone will stop ringing in the DSS office (disabled student services). To remove some of the mystery of ADA compliance, please review the following guidelines related to classroom tables taken directly from the Federal Government's ADA Guidelines (section 4.3). 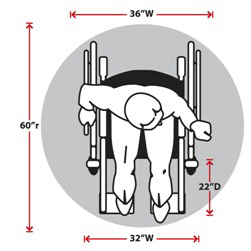 *Since the size of people and wheelchairs vary, the guideline recommends the table top height should be positioned between 28"H-34"H. If you would like additional information about these guidelines, please call our office at 281-535-2288 or contact your CCI salesperson today. Below are some of Computer Comforts' products that comply with these guidelines.